Recently, Chelyabinsk-based advertiser and designer Albert Rastyapin completed a four-meter triptych dedicated to the meteorite that fell a year and a half ago in the vicinity of the Urals city. The meteorite, which has also inspired local Russian businessmen, has also significantly increased the Ural region’s attractiveness as a tourist destination. On February 15, 2013, the whole world learned of the small Ural town of Chebarkul, located in the Chelyabinsk Region 1,050 miles east of Moscow. It was a few miles from this town that a meteorite, the largest such space object since the legendary Tunguska meteorite, fell into Lake Chebarkul. The rock from space awakened the imaginations of local Ural residents. “It’s great that it fell here, and not in Kazakhstan,” cheered Chelyabinsk residents after recovering from the initial shock. The city opened an extreme sports park in the meteorite’s honor and erected a monument. It was even suggested that the image of a meteorite be added to the region’s coat of arms. The principal heroes of Albert Rastyapin’s four-meter triptych are Chelyabinsk residents, depicted at the moment of the incident. Rastyapin painted them using a dozen of his friends as models. The painting features rescue workers, people injured by broken windows, onlookers with phones, and a half-naked man who ran outside after being awakened by the meteorite. The artist created his epochal canvas in about a year, using his free time and sitting in front of his easel until late at night. This year, a group of enthusiasts from the small Moscow studio SC-Art began filming a science fiction thriller about the meteorite. This will be a feature film, albeit a low-budget one, that will give an alternative version of events on that day a year and a half ago when the meteorite fell to earth. Some Twitter users created a microblog, @Che_meteorit, only a few hours after the meteorite fell. “I’m destroyed. I’m lying all over the Urals,” said the very first person to post. Now “Chelyabinsk meteorite” has 1,035 followers and still sometimes posts. The meteorite also inspired 14-year-old Chelyabinsk student Matvei Grevtsov to consider the global problem of alternative energy sources. His project even reached the final stages of Google’s international Science in Action competition. In the wake of the meteorite’s flight, the powerful airflow damaged many windows, and Grevtsov posited that the enormous amount of pressure could have been used to generate electricity. 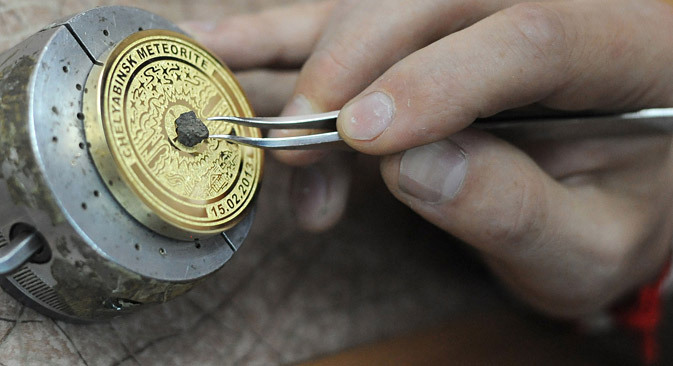 Entrepreneurs came to life in the first week after the meteorite, registering trademarks including Chelyabinsk Meteorite, Ural Meteorite, Chebarkul Meteorite, and Mysterious Meteorite. Merchants offered candy and baked goods with a symbol of the meteorite, as well as stationary, coffee, and tea. Similar projects also took off in the wake of the cosmic event. One Chebarkul entrepreneur created a line of meteorite-scented perfume. Local authorities supported the project and even provided a piece of the meteorite so he could get the smell. The entrepreneur wanted to create a fragrance that would symbolize people’s ability to survive any disaster. The perfume’s packaging is emblazoned with a picture of Lake Chebarkul, where the meteorite fell. Of course, tourism has flourished in the region. Earlier, Chebarkul attracted tourists as “the land of the Orenburg Cossacks,” but now there has been an abrupt shift in interest to space. “A number of different orders are coming from foreigners – everything from individual visits to the site where the meteorite fell to organized tour groups of 48. Most of the interest is from the Japanese, while no Russians are showing interest in such tours,” said Marina Alekseyeva, owner of Chelyabinsk travel agency Akbest Tour, in an interview with Ria Novosti. Local officialdom has also jumped on the meteorite bandwagon. The Chelyabinsk Region is offering official souvenirs in the form of a meteorite, and the administration has applied to Rospatent to trademark Chelyabinsk – Russia’s Meteor Capital. In Chebarkul, close to where scientists located most of the ‘alien’ debris, a city commission has decided to ‘brand’ the territory. “There are dozens of resorts in the area, and guests can take a trip out to the crash site. Any ideas? For the best we’re ready to award a piece of the meteorite!” said the creative mayor in his blog.